It is with regret the Club has to announce the death of Full Member Mick Hill who died on 19 November, aged 70 years after a long illness. Mick joined the Club in February 2000. He was a stalwart of the national Super Saloons racing scene in the early seventies building and driving some memorable cars of the period. These included the J’Anglia (a Jaguar engined Ford Anglia), the 5 litre VW Beetle Super Saloon Beetle (under whose shaped skin was a Chevy V8 from Mike Wilds’ F5000 March, Trojan F5000 suspension and a space chassis) and the Ford Boss Capri V8 (which used a GT40 engine and T70 parts). Mick recorded a total of 96 overall race wins, securing 7 championships along the way in a career that stretched over 21 years. Mick was ranked first in the 1971 Autosport National Survey of Race Results with 33 overall wins, all in a year that included winning the Triplex Saloon Car Championship. 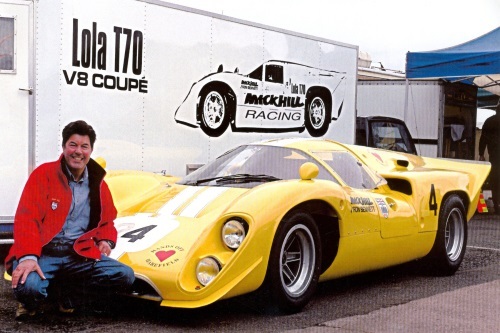 He also recorded 20 overall wins in 1972 which allowed him to become National Hepolite & Glacier Saloon Car Champion. In 1973, Mick was crowned KMS Silverstone Driver of the Year and Esso Uniflo Special Saloon Car Champion with 18 overall wins that year and his 10 overall wins in 1974 allowed him to win the Super Saloon Championship and the Forward Thrust Saloon Car Championship. The funeral will be on Wednesday 3 December at 2pm at Markeaton Crematorium, Markeaton Lane, Derby, DE22 4NH. All are welcome.